I unfortunately didn’t make it to Photo Books International, but was able to spend a lot of time in Claire de Rouen on Charing Cross, which has a wide and varied selection. Discovered a lot of great books that were new to me. Generally, any good bookshop in London (galleries, even) has a better selection of photobooks than you’d find anywhere in the States. Surprise, surprise. Keith Arnatt’s vintage prints of tourists and dog walkers from the late sixties from his show “I’m A Real Photographer” at the Photographer’s Gallery had a true force and clarity. They echo Arbus’ offbeat explorations, while being a typology, a visual classification of an intriguing group. The bookstore at the gallery is tremendous, and I spied titles I don’t own and have been wanting to leaf-through, like Kalvar’s “Earthlings”, and Papageorge’s “Passing Through Eden” (which I’d only quickly perused at his show in NYC, see Soth’s interview), and lots of British photographers, including all the latest (and out of print) from Mr. Parr. In sale bins across London, I saw Winogrand’s “Figments” and Beat Streuli’s “New York City”, but the weakness of the dollar to the pound made even sale bin purchases prohibitive. There are dueling press photography exhibits up right now. The present vs. the past. Friend of 2point8, Nils Jorgensen had a picture in the former, but by and large, the digital printing of digital images left me wanting a little more vintage clarity, which I found at the “Daily Encounters: Photographs from Fleet Street“. 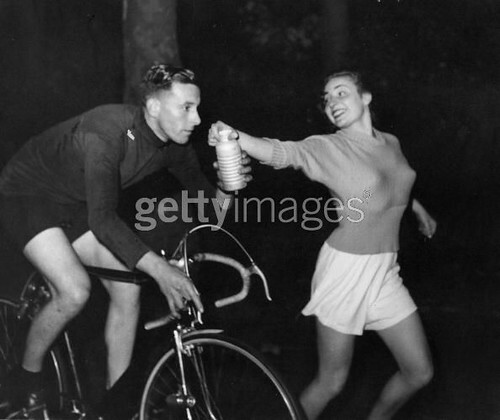 Most of the images from Daily Encounters are the property of Getty Images, like this one from Bert Hardy of cyclist Ken Joy breaking the London to Brighton speed record in 1949. I wonder what’s in the bottle. is “How Are We Now” at Tate Britain, which is an exhaustive survey of the history of British photography, as seen by Brits (and Germans and Americans who happened to have lived or studied there at one point). I mentioned Albrecht Tubke already, but it was interesting to see not just the early documentarians who photographed all manner of Britain’s population in the 19th and 20th century, but what the heck happened in the 80s, when a group of color photographers appeared to start taking nearly identical photos. The difference between Parr, Anna Fox and Paul Reas is the difference between stout, porter, and wee heavy. All three are powerful, but after a few, it can be hard to know which you’re tasting. Parr’s work has achieve a ubiquity that makes it difficult to see with fresh eyes. And apparently, Anna Fox studied under Parr, which explains the influence. Paul Reas is Parr’s equal. His site is flashed-based and it feels like he could have multiple portfolios that just haven’t made their way to the web. But what’s there is a wow. And apparently he’s done two books that are out of print. Stephan Vanfleteren has a choice show, “Flandrien” at HOST (Honduras Street Gallery) which is related to the Panos Pictures agency. 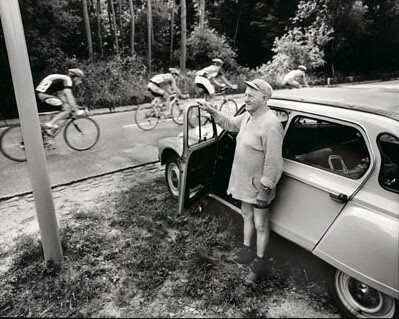 Best cycling pictures (portraits, action shots, landscapes, etc…) I’ve seen, especially in black and white. More ambient and evocative than Graham Watson, even. great blog – i’ve been reading for quite some time. i’ve been meaning to write a cycling post for a while, maybe soon. one of my other favorites is Philippe Brunel’s Intimate Portrait of the Tour de France. It was really nice to get the opportunity to meet you. Very nice evening. However, telling friends that I was going to meet a guy who had befriended me on the internet just didn’t sound right somehow. There must be a better way of putting it.